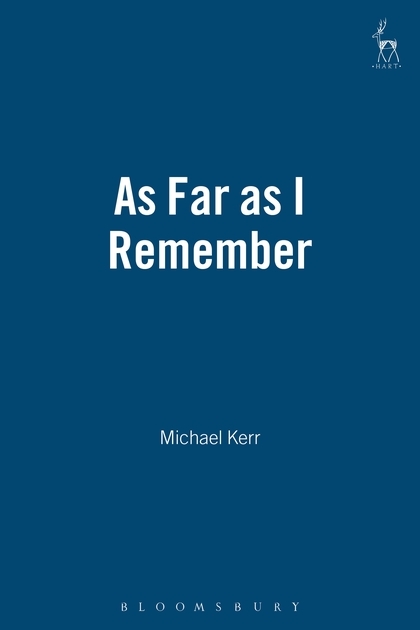 This candidly written autobiography of Sir Michael Kerr chronicles the life of one of Britains most prominent judges of the 70s and 80s from his Continental childhood up to his career in the Court of Appeal and beyond. In the first part of his memoir,the author traces his family history and Germanic roots. His father, Alfred Kerr, was a well-known dramatic critic and essayist, whose writings were widely known throughout Germany from the turn of the century and have recently seen a resurrection, 50 years after his death, as related in the last chapter of the book. But because of the fame of his anti-Nazi writings and broadcasts, the Kerrs were forced to flee from Berlin as early as 3 March 1933, when Hitler came to power. The author and his sister Judith, later to become a famous author of childrens books, had a relatively happy cosmopolitan childhood in Zurich, Paris, Nice and ultimately England. But their parents lives remained on the edge of poverty and sometimes despair and there was never again a family home. The memoirs then tell of his years at Aldenham School and the beginnings of Cambridge, and of his assimilation into the English way of life. They relate the story of his internment as an enemy alien in 1940 and of his subsequent release and service as a pilot in the Royal Air Force until the end of World War II. The author then returned to Cambridge to finish his law degree and was urged to go the Bar. The later chapters of this autobiography are mainly devoted to the law. They recount the authors career as a leading commercial Junior and then a Silk, his initial hesitations about the Bench, but ultimately culminating in his appointment as a Lord Justice of Appeal. He describes the Bar of the post-war decades and is frank about the frustrations and disappointments of his career. He also provides insights into the oddities of the English legal system, but maintaining throughout his firm belief in the importance of an independent Bar. an important account of what is was like to be a refugee from persecution who found sanctuary in this country. contain qualities often missing from judicial autobiographies: experience and judgment. “The reader discovers in the pages of this volume a sensitive, yet tough, courageous and determined man. There is frankness in greater measure than many would have wished. I do not think it is too much to describe this book as an inspiration. 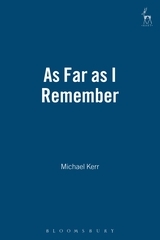 Sir Michael Kerr was a leading member of the English bar during the post-war period who became Chairman of the Law Commission and a member of the Court of Appeal.